For the third consecutive year, PhotoShelter releases the What Buyers Want From Photographers survey in partnership with Agency Access, a full service marketing agency for artists. Photographers will also find email and direct mail tips to help improve their marketing efforts and attract potential clients. For example, on the importance of personalizing a pitch, says one Creative Director from an advertising agency, Make sure your email comes across as genuine. This means dont act like a car salesman with gimmicky phrases and subject lines. Make the email personal – we can smell a form letter in seconds. PhotoShelter and Agency Access also partnered in 2011 and 2012 for their annual What Buyers Want From Photographers survey. The 2011 and 2012 surveys are part of PhotoShelters ongoing series of free business guides for photographers. PhotoShelters library includes 30+ educational guides including topics such as creating a successful photography portfolio, email marketing, and starting a photography business. All can be downloaded here: http://bit.ly/psresearch. PhotoShelter offers the most professional, reliable and innovative online tools to build and grow a successful photography business. Its latest release, Beam, offers a suite of portfolio website templates built with the latest technology to showcase images at their best. Over 80,000 photographers use PhotoShelters websites, social and SEO tools to attract new clients; online image archives to stay organized; and image delivery and e-commerce tools to sell their work. To grow your business, manage it more efficiently, or find new ways to market yourself and delight your clients, try PhotoShelter free for 14 days when you visit http://www.photoshelter.com. Full service marketing for artists, Agency Access provides direct marketing for commercial photographers, illustrators, artist reps and stock agencies. The companys sole purpose is to help its members find new clients. Agency Access offers many in-house services to encourage and educate artists to get the most from their marketing efforts, including access to a global database of 90,000-plus commercial art buyers at ad agencies, magazines, book publishers, in-house advertising departments, graphic design firms and architectural firms. A full spectrum of integrated marketing tools including email marketing, direct mail printing and mailing, phone marketing, consultation services and design services makes it easy for artists to connect with the right buyers. Visit Agency Access here: http://www.agencyaccess.com. TisBest Philanthropy, the leading provider of donation gifts, announced today the addition of graphic designer Brittany Burkfield to the TisBest team. Brittany is a recent graduate of Northwest College of Art and Design and is completing a marketing degree at California Coast University. Other recent changes at TisBest include the appointment of Chad Edwards to the position of Director of Creative Services, and Karli Larson to the position of Manager of Education and Charities. Chad has been with TisBest since 2009. In his expanded role he will take supervisory responsibility for all customer-facing properties, including website design, user interface and user experience, and online and offline marketing materials. Karli joined TisBest in 2012, and will lead the DiscoverGiving program, a classroom philanthropy project from TisBest which is scheduled to launch October 1. She will also manage the relationships with TisBests nearly 300 charity partners. TisBest Philanthropy is a 501(c)(3) nonprofit organization dedicated to fostering the growth of non-material gift-giving. TisBest created charity gift cards in 2007. Charity gift cards work like conventional gift cards, but with one important exception: the recipient of a charity gift card “spends” it by choosing a charity to receive the funds. With a TisBest Charity Gift Card, you make the donation and your recipient decides how to spend the donation, choosing from TisBest’s 300+ charity partners. Learn more at http://www.tisbest.org. The DiSTI Corporation, a leading developer of interactive 3D software and customized training solutions, enabled early training for the Academic Training Center (ATC) at Eglin Air Force Base through advanced virtual maintenance training technology. DiSTI was selected by AAI Services Corporation for development of the F35 Lightning II Aircraft Systems Maintenance Trainer (ASMT), as one part of the F35 training system that was developed by Lockheed Martin. The ASMT gives the ATC an innovative training method and increases student throughput prior to the aircraft being fielded. The ASMT provides training for student maintainers with curriculum covering ground operation, maintenance, and testing procedures. Through its latest software tools and processes, DiSTI streamlined the conversion of Computer Aided Design (CAD) data provided by Lockheed Martin to produce a high fidelity and interactive virtual maintenance environment for the ASMT. By creating a lifelike virtual representation of the actual F35 jet and its components, DiSTI worked with AAI to produce a training application that immerses students in a compelling 3D virtual environment. The desktop trainers such as the Aircraft Systems Maintenance Trainer, requires each student to follow the procedures of checking out virtual tools, reading the maintenance checklist, and individually performing each task, said Brian Vohl, Lockheed Martins Weapons Instructor. The 33rd Fighter Wing at Eglin has eight basic familiarization courses in session where the students have access to the computer simulators. Student maintainers now have a way to become familiarized with the F35 by working on a virtual aircraft before the actual aircraft is delivered. This comprehensive training solution aided the Air Force students at Eglin to gain their first certificate of completion in the F35 courses for structures, avionics, weapons and crew chief career fields. This is hugely significant for all services because we are getting our maintainers prepped for when we are fully stoodup for F35 training in the near future, said Col. Andrew Toth, 33rd FW Commander. The classes are another exciting step forward in the 2012 execution year for F35 training. DiSTIs renowned virtual maintenance training technology has been implemented in numerous high profile programs for the U.S. and foreign militaries, solidifying our position as a leader in the field. The ASMT is no exception. It produces highly realistic virtual training, reduces development time and costs, and gives the students a way to become familiar with the aircraft before they lay their hands on one for the first time, said DiSTI President, Joe Swinski. Since its delivery to the ATC at Eglin Air Force base, the ASMT has become an integral part of the training curriculum. In March, approximately 100 maintenance students from three branches of service began the inaugural classes for the F35 basic familiarization courses at Eglin AFB. For more information on DiSTIs specialized technology and virtual maintenance training solutions, visit http://www.disti.com. DiSTI is a global leader in the development of Human Machine Interface software for businesses, governments and the military. The companys flagship product, GL Studio, enables programmers and developers to build highfidelity graphics, 3D simulations and fully interactive controls into their models, enhancing the level of realism and sophistication, while improving learning and retention. More than 500 customers worldwide, including BAE, Boeing, Dassault, FedEx, Lockheed Martin, Honeywell, Raytheon and Thales, use DiSTI solutions to build maintenance trainers, create PC and Internetbased courseware and to develop components for safetycritical applications. As a full service provider, DiSTI offers a complement of customer programming and development services, and is the recognized leader in training solutions for the global simulation and training community. For more information, visit http://www.disti.com. The GIF has been adding motion to still imaging since 1987. In the beginning, GIF animation was reserved for the pros; the only people building them were clip art enthusiasts and pre-social media innovators looking to take their content viral. But as the development of sharing technology launched video content into the forefront, more and more GIF images started popping up within Internet space (thanks to a mixture of supply/demand and improved GIF generator technology). Today, companies like Cinegif and Cinemegraphs.com are making it easy for small businesses to build beautiful GIF images designed to upgrade a marketing campaign or support a new wave of premium web advertising. Looking to cut through email marketing noise? Perhaps a well-placed, high-res GIF image is just the answer for spicing up one’s ROI. With email marketing growing at about a 20% annual rate, marketers are looking harder than ever for techniques to instantly separate themselves from the rest of the competitors in their field. A unique, flowing image certainly fits that bill. In fact, companies like Coca Cola, American Apparel, and HubSpot are already rolling out GIF animation in their email marketing structure. Maintaining an updated web graphic is important to most businesses looking to stay on top of a fast-paced industry. After all, one isnt likely to view a clearly outdated site and claim, “Wow these guys really have it together!” But designing online eye candy is more important than just saving face. Recruiting GIF technology to one’s site could boost ad revenues, as ad men are continuously intrigued, fascinated and won over by both aesthetics and improved click-through rates. Study Breaks College Media provides a one-stop solution for small businesses, providing them with big marketing strategies and delivering college students. DigiFest South, a new digital arts festival and career fair being organized by the Bossier Arts Council in Bossier City, Louisiana, is presently seeking digital artists, vendors, and sponsors for their inaugural event, which will take place, Sept. 7-9, at the Bossier Civic Center. Artist application forms, vendor registration forms, and sponsorship agreement forms are available online at http://www.bossierarts.org. Categories for original works of art being sought are: 3D Design and Animation, CG Animation, Digital Photography, Digital Sculpture (Robotics), Digital Sound and Music, Digital Video and Film, Graphic Design and Motion Graphics, and Mechanical and Architectural Design. The deadline to submit applications for artists, vendors and career fair participants is July 31, 2012. DigiFest South is an annual digital arts festival and technology career fair that celebrates how digital technology has combined with artistic creativity to shape modern society. The event includes a digital art exhibition and a career fair featuring cutting-edge companies and educational institutions. DigiFest South organizers seek to convey the message that art education is more than a school elective; it is a powerful vocational element. Theres a lot of tech-based infrastructure in Shreveport-Bossier, said DigiFest South Organizer Clint McCommon. We have a growing community of digital technology, and we want DigiFest South to highlight that for this area. For more information on DigiFest South, contact Clint McCommon at (318) 780-5924 or clint(at)fairfieldstudios(dot)com. Construction industry has been hammered by the Great Recession. Construction companies that are looking for ways cut cost can turn to ezPaycheck payroll software. Halfpricesoft.com (http://www.halfpricesoft.com) released the new 2012 ezPaycheck payroll software, which makes it easy to handle salary, hourly-pay, bonus, commission and other customized rewards. Founded in 2003, Halfpricesoft.com has established itself as a leader in meeting the software needs of small businesses in US. EzPaycheck payroll system is designed to automate paycheck processes to reduce the time spent on running payroll. The softwares graphic interface leads users step-by-step through setting up employee information, importing data, calculating payroll – including calculation of federal, state and local taxes; deductions for Medicare, insurance and 401(k) plans; and printing paychecks. Payroll job is important for any business and organization, however calculating payroll taxes can be very time-consuming. We believe small business should focus their time and energy on running their businesses, not trying to figure out how to run payroll software” explains Dr. Ge, President and Founder of halfpricesoft.com. We intentionally engineered ezPaycheck payroll tax software for those end-users who are not professional accountants and payroll tax expert, so small businesses can set up ezPaycheck quickly and easily. Available for just $ 89 per year ($ 59 to renew), ezPaycheck payroll software has remained at that affordable price since its initial release in 2005. New user can download and try this software for free with no obligation and no cost at http://www.halfpricesoft.com/payroll_software_download.asp. 30 day free trial. No registration required and absolutely no obligation. Halfpricesoft.com is a leading provider of small business software, including payroll software, employee attendance tracking software, check printing software, W2, software, 1099 software, and barcode generating software. Today Software from halfpricesoft.com is trusted by thousands of users and help small business owners simplify their payroll processing and business management. 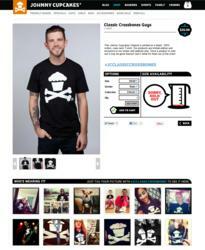 After shutting down its website in anticipation for relaunch, Johnny Cupcakes, the independent fashion brand with a recipe for success, is unveiling a new web experience today for its community at JohnnyCupcakes.com. From becoming a Johnny Cupcakes model to engaging with other Cupcakers, thousands of fans and customers alike can now virtually experience Johnny Cupcakes on a personal level. Through extensive customer research, the brand discovered its passionate followers were most drawn to Johnny Cupcakes for its tightknit feeling of community, exclusivity and unique personality. These core elements have long been cornerstones of Johnny Cupcakes events, retail bakery environments and endless community surprises, but less prominent online, driving the brand to redevelop its digital presence to create a signature experience. Community is the most important part of our brand, and everything we do is dedicated to creating a personal experience that hopefully makes people smile and laugh, said Johnny Earle, Head Baker and CEO for Johnny Cupcakes. While many brands struggle to engage customers, our community and social interactions have been at the heart of our brand from the start, and were leveraging these core values in exciting new ways online. Santa Fe University of Art and Design(SFUAD) will host its inaugural ArtFest12, a festival that brings together students and faculty members from around the world for three weeks of academic and artistic workshops, as well as cultural activities focused on graphic design, film, photography, creative writing, fine art, concept art, animation, music, dance, and architecture. The festival, which runs from July 16 through August 3, is open to domestic and international students 18 years and older, high school art teachers and counselors, and residents of New Mexico. Participants will be immersed and inspired by the unique environment of Santa Fe, which The Atlantic ranks as the most artistic city in the country. ArtFest12 is a perfect opportunity for current students to experience art and design in a whole new way, said Larry Hinz, president of SFUAD. Bringing students and emerging artists from various countries and disciplines together within a classroom setting gives participants the chance to learn different techniques and be exposed to new cultural influences. The event features workshops on a variety of topics, including micro cinema, flash animation, African drumming and digital photography. So far, more than 100 students and faculty members from Italy, Spain, Ecuador, Brazil, Panama, Chile, Honduras, Mexico, New Zealand and Germany have registered to participate in ArtFest12. 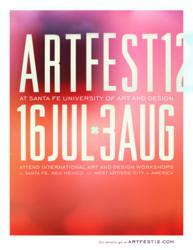 International students have the opportunity to participate in Santa Fes tremendous art and culture scene, Hinz added. Its our goal to open their eyes to the possibilities of art in New Mexico so they come back to visit or take more classes at the university in the future. Several cultural and social activities are also part of the festival, including Shakespeare on the Quad and a screening of Hide Away, the latest film directed by Chris Eyre, chair of the Moving Image Arts Department. Many of these events are also open to the public. Members of the Santa Fe and New Mexico community are also invited to participate in the three-week ArtFest12 workshops for $ 300, which includes tuition, course materials and on-campus ArtFest12 activities. Registration is limited and on a first-come, first-served basis. For more information and to sign up for a workshop, visit the ArtFest12 website. Santa Fe University of Art and Design is an accredited institution located in Santa Fe, New Mexico, one of the worlds leading centers for art and design. The university offers degrees in arts management, contemporary music, creative writing, digital arts, graphic design, moving image arts (filmmaking and video production), performing arts, photography and studio art. Faculty members are practicing artists who teach students in small groups, following a unique interdisciplinary curriculum that combines hands-on experience with core theory and prepares graduates to become well-rounded, creative, problem-solving professionals. As a Laureate International Universities Center of Excellence in Art, Architecture and Design, the university boasts an international student body and opportunities to study abroad, encouraging students to develop a global perspective on the arts. Santa Fe University of Art and Design (formerly the College of Santa Fe) is accredited by The Higher Learning Commission and a member of the North Central Association, http://www.ncahlc.org.